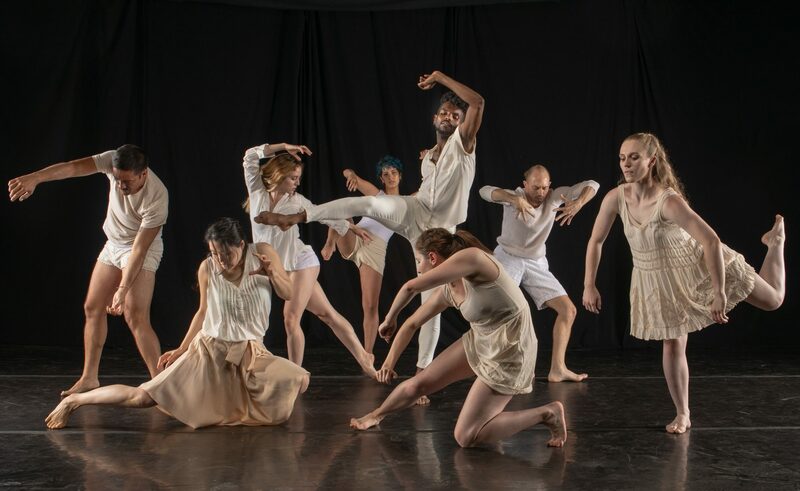 NCDF presents ShaLeigh Dance Works’ Dead Mans Walk, the company’s touring excerpt from I Promise at Greensboro Project Space Gallery. Tonight we performed Dead Man’s Walk as a part of NCDF at Greensboro Project Space Gallery. The performance also featured The Bipeds and Megan Mazarick. In this intimate performance space, The Bipeds’ presented their duet for banjo and movement hybrid of dance and song. Megan Mazarick’s solo dance story “monster,” unpacked female identity in new ways, remixing the metaphor of “hero vs. villain” to showcase the body in transformation. A short audience/artist conversation followed with an eager audience and great questions. We were excited to have such an engaged audience with so much curiosity and inquisitiveness about our work! We left feeling so appreciative of our well received performance and I was elated to see my former mentor Christopher Morgan in the audience! I was paired with Christopher as my mentor in 2009 as resident artist with Dance Theatre Workshop. Only while writing this am I learning that they closed their doors in 2011, one year after I left NYC. DTW was a prominent performance space and service organization for dance companies in NYC. It was founded in 1965 by Jeff Duncan, Art Bauman and Jack Moore as a choreographers’ collective. In 2002 DTW opened the Doris Duke Performance Center, which contained the 192-seat Bessie Schönberg Theatre. It was incredible to chat about this work with Christopher after he witnessed my very beginnings in NYC in 2008. To sum up his words, he simply said, “It was beautiful. Keep going.” And like an early 20 something all over again, I was ecstatic. Leading a company is not an easy journey though I wouldn’t trade it for the world. But in that moment I was filled with utter hope and confidence. Keep going. Next PostNext SDW is a proud supporter of Live Globally!